I’m definitely a carb- loving gal. I really don’t feel satisfied unless I’ve had some sort of carb on my plate… Or end my meal with something sweet. I suppose that’s my downfall when it comes to losing weight – I love food way too much to actually limit it. Anyway, my sister bought me this cast iron skillet for Christmas, and I’ve only used it twice before – one attempt at making a deep dish stuffed crust pizza (and I do say attempt, because that meal epically failed – it was edible, but you had to eat it with a fork and the crust to topping ratio was off. Way off.) and then one time I made a sweet potato and Italian sausage hash. I feel like I need to use it more often, so any time I see a cast iron skillet recipe on Pinterest, I pin it. Not that I can’t use it for everything, but the lack of using it has caused it to not be seasoned sooo everything still sticks. Insert this recipe. This recipe is something that comes together in under 30 minutes (unless you’re pairing it with rice – then you might want to start the rice well in advance, because this meal will be completed before you know it.) And the great thing? It’s packed with so much flavor and a little bit of heat. Heat olive oil in skillet. 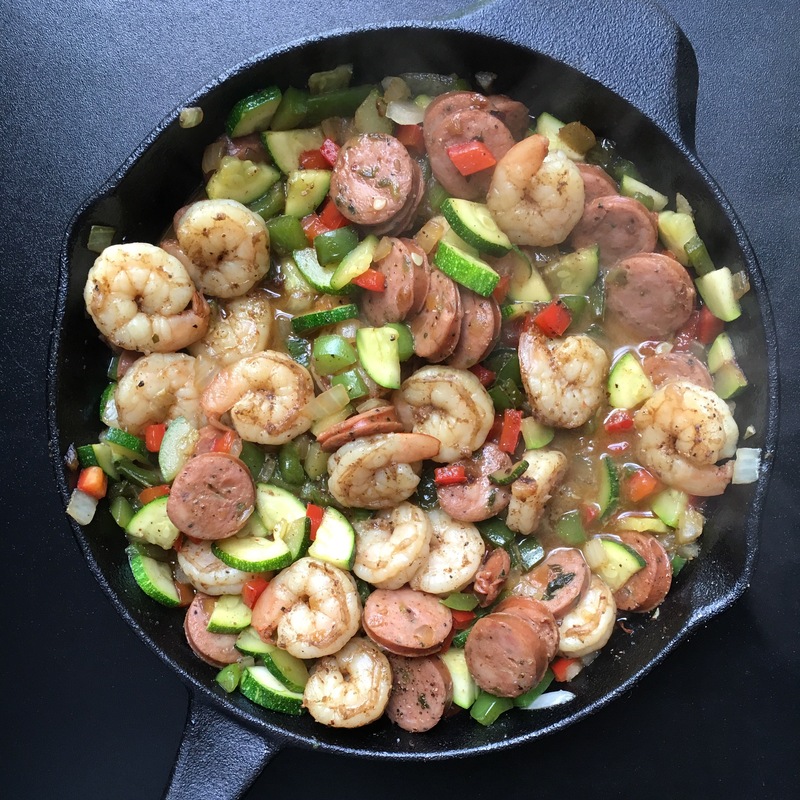 Season shrimp with Old Bay seasoning and then put in skillet, cooking for about 3-4 minutes or until shrimp turns opaque. Then remove shrimp from skillet and set aside. Add the peppers and onions to the skillet and cook until they begin to soften (about another 3-4 minutes). Add the zucchini and sausage to the skillet next, cooking for an additional 2 minutes – or until sausage and zucchini are warmed thoroughly. Put the shrimp back into the skillet and add the chicken stock. Season with salt and pepper. **Serve with rice and diced avocado for a well-balanced meal. This looks great and versatile. Currently, I have potatoes, onions, and corn from our CSA share this week. I bet I could use those in it!